:p Lol, oh dear thats not good... maybe Mr Rex is just very big? Maybe it was genetically modified? makes sense. and as you can tell by name, avatar, and sig, I run into that alot!!! I'm a little behind, but I have 2 more movie reviews to put up. The Plot: Clark Kent prepares to tell Lois his secret, while brainiac attacks Superman in an attempt to take out Superman so there is no one to stand in his way. This makes Clark question the results of what telling Lois would do, and if it would only put her in more danger than ever....after all.....her blood is already merging with Kryptonite, and no he has to go into the Phantom Zone for a cure. My Thoughts: It was an ok movie. Basic superhero expectants. Some laughs (like how my dad and I couldn't stop laughing at Lex actually saying "Brain Freeze" that one time!) I guess that makes it above average, it was enjoyable, but not that much to speak of. I give it a 3.5 out of 5. The Plot:The Canadian government sends in Wolverine to bring down the Hulk after he supposedly wrecked numerous villages across the border reaching civilization. After being hit by tranqs, Wolvie wakes up to Weapon X, who caused the destruction, wanting to make Logan and the Hulk their own personal super-weapon. My Thoughts: This movie, all be it on the short side, is one I always love to watch. I like the animation, awesome fight scenes, and it gets real serious without getting too far down that road. Why? An old favorite of mine, DeadPool, keeps stealing the spotlight here. It has blood, humor, explosions, and a cute surprise scene after the end credits. I can't help it, gotta give this one a 5 out of 5. The Plot: As Victor rehearses his wedding vows, being in the woods trying to escape the harsh family, accidently proposes to a corpse, who vowed to get married when she was mudere the night she was set to elope. My Thoughts: It is anawesome movie, and the songs are really catchy too. I still can't get the song out of my head that explains the origin of the Corpse Bride!!! Die, die, we all pass away. Don't you frown, cuz it's really ok. The animation can get on yours nerves, but that's typical for a Tim Burton film, so I'm willing to look past it. I give this a 4 out of 5. The animation can get on yours nerves, but that's typical for a Tim Burton film, so I'm willing to look past it. I have to take issue with that statement. It is not typical of a Tim Burton film (unless you meant the visual style) but of stop-motion animation. And I'm on the opposite side of the spectrum regarding stop motion - I love it! I think that's what gives Corpse Bride its charm (same with Coraline and countless other animated movies). I'm glad people are still willing to invest the time in doing stop motion, especially feature length stop motion. Allow me to rephrase. It is typical for movies such as this, The Nightmare Before Christmas, Coraline, and maybe a few others, though off of my mind the only movies that did aside from Coraline was directed by Tim Burton. It still bugs me a little, but it adds to the creepy side so I'm for it. I absolutely agree! I much prefer this over the Pixar-style of animation. I also have somewhat of an issue with this statement. Stop motion is one of my favourite mediums for film and I believe it is one of the most visually pleasing types of animation. Corpse Bride itself is an extremely important film as far as stop-motion animation goes as it was a first in many fields. Not only was it the first stop-motion film to be entirely edited in Final Cut Pro but it is also the first stop-motion film to be made using digital SLR cameras over film cameras. For these reasons it has been hailed as somewhat of a remarkable step forward in digital film making, one that really shows in the outstanding final product. Out of these films the only one Tim Burton actually directed was Corpse Bride. While Burton clearly had a lot of input and influence in the creation of The Nightmare Before Christmas it was actually directed by a man named Henry Selick, who is also responsible for Coraline. Henry Selick also did Monkey Bone.. "Monkey Bone" in the movie is also stop motion... its the only film I like by that director... In fact I love that film and usually I love Stop motion.. I'm making a music video for a local band currently and I am using Stop Motion in certain places. Anyway... I think there is a difference between the stop motion used in Corpse Bride and say... Bagpuss it looks different. and personally I to did not enjoy it. But meh, lets be honest... all films are subjective and we can disagree till the cows come home, an opinion is an opinion. And they don't always behave themselves! 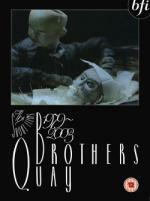 Does anyone here know the Quay Brothers? A lot of there work is stop-motion animation, but not exclusively. It is also available as R1-US from Zeitgeist, but that seems to be a PAL-NTSC transfer.